Sharon Shorty drums while Duane Ghastant' Aucoin performs "the grouse dance" – a traditional Tlingit mating dance. Sharon Shorty’s childhood was full of laughter. Her Gramma Carrie told traditional Tlingit stories to anyone who would listen and she had a knack for making anything funny. Shorty recalls that her grandmother’s presence alone seemed to make those around her laugh hysterically. Her grandmother’s favourite stories involved the raven – the central character in many traditional Tlingit stories. The raven is seen as a reflection of creation in his human-like nature, says Shorty, and is believed to have stolen the sun and stars from their hiding places in order to share them with the world. Gramma Carrie’s favourite stories revolved around the raven playing tricks on himself. Shorty remembers vividly a story about the raven losing his eyes and punishing them by bouncing them up and down off the ground. Looking back, Shorty understands her gramother’s humour served a purpose. Through her comedic variations of those traditional stories, she taught those who listened the value of their culture and beliefs – and inadvertently birthed Shorty’s career in comedy. Sharon Shorty explains that the clan system is an integral part of First Nations culture. Shorty was born and raised in Whiskey Flats, a neighbourhood in downtown Whitehorse, where Rotary Park is located today. When Shorty lived there, Whiskey Flats was home to approximately 350 people – the majority of them squatters. Shorty says she was surrounded by people of all cultures and nationalities. “The only thing we all had in common was that we were dirt poor,” Shorty says with a laugh. Being raised there had a big impact on how she viewed the world, her community and, ultimately, her sense of humour. The S.S. Klondike chugs along the shores of Whiskey Flats Whitehorse, YT, circa 1975. Photo from Learning Resources Corp. Ltd. collection through Yukon Archives. Assessment map of Whiskey Flats Whitehorse, YT, in 1957. Accessed through Yukon Archives. Shorty remembers one of her first performances in 1991. One day, Shorty was caught off-guard by her grandmother, who asked her to tell a story. “I don’t know any stories, Gramma,” Shorty recalls saying. “Well, weren’t you listening to me all this time?” her grandmother responded with a grin. Shorty decided to repeat one of the stories her grandmother had told her. Soon after, she accompanied her grandmother to the storytelling festival in downtown Whitehorse to perform with her. Shorty is a member of the Raven clan and has Teslin Tlingit, Northern Tutchone and Norwegian ancestry. Ancestry has always been, and still remains, extremely important to the comedian, evidenced by her current role as speaker of the Teslin Tlingit Council. Shorty has also worked as a playwright and actor, and was Regina’s first Aboriginal Storyteller-in-Residence for its 2004 centennial storytelling project. Shortly after returning home from Saskatchewan, Shorty became the founding artistic director for the Society of Yukon Artists of Native Ancestry. Shorty’s career has taken her across the country and overseas. She has won a number of awards, including the Aurora Award for acting (1997), the Aurora Award for storytelling (1998), the Ross Charles Award for broadcasting and telecommunications (1999), the CTV Fellowship (1999), the Yukon Filmmaker’s Fund Award (1999) and the Advanced Artist Award for a self-directed residency at the Banff Centre (2011). Shorty has appeared at various festivals and workshops in Nova Scotia, Australia, Hawaii, New Zealand and Switzerland. One of her notable performances included an appearance at the Vancouver 2010 Olympics. Shorty lost her grandmother the same year her friend Sarah lost hers. Devastated by their grandmothers’ deaths, they would spend hours mimicking them, giggling at the memories. The lighthearted way of dealing with the painful loss gave Shorty the idea to embody the people who had made her laugh all along. She made a compilation of all of the influential people in her life – her grandmothers, the elders in her community – and created a character, now widely known as Gramma Susie. 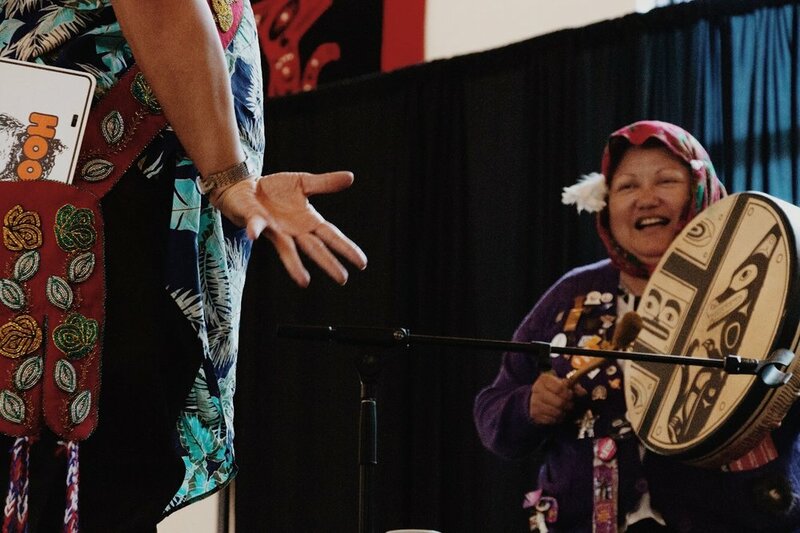 Shorty teases an audience member during her performance at a totem-pole raising in Carcross, YT, in July 2018. In 2001, Shorty asked longtime friend Duane Ghastant' Aucoin to join her in her comedy act as Cash Creek Charlie, Gramma Susie’s boyfriend. Ghastant' Aucoin’s relationship with Shorty began when they were children and involved Gramma Carrie. A post-performance photo of the duo from a previous show. Credit: Photo courtesy Duane Ghastant' Aucoin. In 2012, Shorty and Ghastant' Aucoin were awarded the Queen Elizabeth II Diamond Jubilee Medal for their significant public service to Yukon and Canada. "The ability to laugh – it is just part of First Nations culture," says Ghastant' Aucoin. Ghastant' Aucoin laughs at one of Shorty's jokes during a performance in Carcross. As Gramma Susie, Shorty wears traditional regalia, mimics her grandmother’s voice and uses common First Nations themes and jokes. Although the comedian uses traditional stories and songs in her performances, she says that her use of contemporary events, both local and on a larger scale, keeps her content fresh and relatable. An example of this is a common theme seen in most of Shorty’s shows in the Yukon: Kentucky Fried Chicken. Shorty says that when she was a young girl, her idol, Colonel Sanders, was in town and her brother got to meet him. When she heard this, she raced downtown but was too late and missed her chance to catch a glimpse of the fast-food icon. To this day, Colonel Sanders remains a vital part of Shorty’s skits, taking the role of Gramma Susie’s “long lost love.” When Cash Creek Charlie and Gramma Susie first started their comedy act together, Charlie was immensely jealous of Colonel Sanders. But, with time, he has come to terms and accepted it. Video by Astara van der Jagt, Lauren Hicks and Dave Elliott. Davida Wood, manager of First Nations Initiatives at Yukon College, is from the same Teslin Tlingit community as Shorty and has known her since birth. Shorty says she more closely identifies herself as a “bearer of culture” and a storyteller than as a comedian. As a storyteller, her comedy is about sharing the world of stories her grandmother shared with her to a generation that may not get to experience the same thing. Shorty and Ghastant' Aucoin perform a traditional song and ask the audience to sing and dance along. An example of Gramma Susie’s teachings can be seen when she explains her and Charlie’s love affair to the audience. She often jokes about their love life while explaining the marriage rules in the Tlingit clan system – with her being Kùkhhittàn (raven) and Charlie being Yanyèdí (wolf). “When people are having a good time, and are laughing, it is an access point for me as a storyteller to share stories about our values and our traditions through our culture. When people are having a good time, they are more receptive to that,” Shorty says. With her comedy, Shorty tries to show off her people’s funny and light-hearted side, instead of dwelling on the social ills that are often painted about First Nations communities. Cash Creek Charlie and Gramma Susie in costume after their comedy act in Carcross. Drew Hayden Taylor knows Shorty’s work well. Shorty starred as Gramma Susie in Red Skins, Tricksters and Puppy Stew, a feature documentary Hayden Taylor produced in 2000 about overcoming “Indian stereotypes” with the use of humour. “Humour is the WD40 of healing," he says. First Nations humour is by no means homogenous, but there is a sense of universality in its vitality, says Hayden Taylor. As a director and writer, he has learned that teaching with humour is just as effective as teaching with dark drama. It has become one of many survival tactics after more than 500 years of colonization. It is one Shorty uses daily. Charlie and Gramma Susie explain the importance of a traditional song to the audience. Ghastant’ Aucoin says he too believes there is much more humour in First Nations culture than most people may think. Laughter not only helps release stress and increase emotional stability, it's contagious. "We laugh, we enjoy life, we heal," he says. Non-Indigenous people often make up a big chunk of the audience. Davida Wood says sometimes people get offended. Hayden Taylor says non-Indigenous people may find the comedy challenging at first because they do not know the characters. Once they get to know them, however, that is when they will be able to embrace the production, its purpose and its objectives. First Nations peoples, on the other hand, relate to the characters right from the get-go. In fact, Hayden Taylor says, comedy acts or plays will last six to eight minutes longer with an Indigenous audience due to roaring crowds. “Native people have a secret understanding of the subtle nuances,” he says with a chuckle. Having worked with Shorty, Hayden Taylor, a fan himself, observed the love First Nations people have for Gramma Susie. Ghastant' Aucoin sees a lot of Gramma Carrie in Gramma Susie. “Gramma Carrie was a unique and special person. Sharon channels a lot of that,” he says. Shorty drums while Ghastant' Aucoin performs the grouse dance, a traditional Tlingit mating dance. Just like in any relationship, Gramma Susie and Cash Creek Charlie go through their ups and downs. For now, they are having fun growing old together. “People ask me when I will stop being Gramma Susie. Well, I am guessing until one day I just put the clothes on and leave them on,” says Shorty.